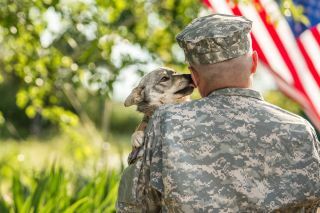 Starin Cares is launching a fundraising event—culminating at InfoComm 2019—in attempt to raise funds to provide a military veteran with post-traumatic stress disorder (PTSD) with a service dog. PTSD is an anxiety disorder that can occur after one has been through a traumatic event such as military combat. A specially-trained PTSD dog can provide a sense of security and a calming effect that can make a difference in the life of a veteran that suffers from PTSD. All donations will go to New Horizons Service Dogs , a non-profit 501(c)(3) organization that partners trained service dogs with those in need. "The costs for housing, feeding, and medical care for raising a puppy and then providing specialized training to aid the recipient can amount to over $20,000 per dog," said Malissa Dillman, CTS-D, CTS-I, market development manager, Starin Marketing. "We are hoping that—through the generous support of our AV industry family—we will be able to raise $30,000 and present it to the New Horizons organization at InfoComm 2019." For more information or to donate, visit https://www.gofundme.com/starin-cares-veterans-service-dog.